Some interesting facts, information or talks about mhealth, mhealth tools, presentation of case studies and user’s stories. Ever heard about the use of Artificial Intelligence in mobile health in developing countries? Well, if that sounds new to you; don’t worry, you are not alone. Last June, the United Nations Agency ITU (International Telecommunication Union) held a conference called ‘AI for GOOD Global Summit’, the first one in its kind, to start discussing the use of Artificial Intelligence applied to developing context and to support the SDGs. I remember over 10 years ago, while studying engineering, AI and robotics were quite new and fascinating subjects, but it was still a niche sector.The idea behind that is to build machines capable of thinking like humans, recognize information, picking up data from different sources, use that data to feed algorithms that can learn and improve their tasks. It sounds sci-fi, doesn’t it? Well, since then, the AI potentials have been widely explored and applied in many sectors. Most likely, we have heard that Artificial Intelligence, machine learning, neural networks stand at the ground of driverless cars, of very smart computers that can beat chess champions or other applications of AI which are enabled by sensors connected to smartphone SIM cards. AiCure, a mobile app that uses AI to verify medication compliance (it can watch you ingest your meds) – and which could be used to scale directly-observed therapy (DOT) for TB (currently dependent on community-health workers) at low cost to all the places that current cannot afford it. Does that still sound sci-fi? Well, it’s real and it’s the future. However, as there are always two sides to every story, the same applies to AI in healthcare. Dr Margaret Chan, Director-General of the World Health Organization, in her opening remarks at the Artificial intelligence for good global summit, invites researchers and stakeholders to be cautious as medical decisions are complex and depends on context and values. “Although machines can aid the work of doctors, organize, rationalize, and streamline the processes leading to a diagnosis or other medical decision, artificial intelligence cannot replace doctors and nurses in their interactions with patients. … we must consider the context and what it means for the lives of people. What good does it do to get an early diagnosis of skin or breast cancer if a country offers no opportunity for treatment, has no specialists or specialized facilities and equipment, or if the price of medicines is unaffordable for both patients and the health system? All of these questions are very important and we should not underestimate them. A name and nationality is every child’s right, enshrined in the Convention on the Rights of the Child and other international treaties. Yet the births of nearly one-fourth of children under the age of five worldwide have never been recorded. This lack of formal recognition by the State usually means that a child is unable to obtain a birth certificate. As a result, he or she may be denied healthcare or education. Later in life, the lack of official identification documents can mean that a child may enter into marriage or the labour market, or be conscripted into the armed forces, before the legal age. Registering children at birth is the first step in securing their recognition before the law, safeguarding their rights, and ensuring that any violation of these rights does not go unnoticed. Most countries have mechanisms in place for registering births. However, coverage, the type of information obtained and the use of resulting data can differ, based on a country’s infrastructure, administrative capacity, availability of funds, access to the population and technology for data management. Rates of registration vary substantially among countries, due to these and other factors. Large differences can be found in the coverage of birth registration among regions. Central and Eastern Europe and the Commonwealth of Independent States (CEE/CIS) has the highest level of birth registration, with 98 percent of children under 5 registered. This is followed by Latin America and the Caribbean, at 92 percent, and the Middle East and North Africa, at 87 per cent. The lowest levels of birth registration are found in sub-Saharan Africa (41 per cent). In Eastern and Southern Africa, only 36 percent of children are registered by their fifth birthday, while the rate in West and Central Africa is slightly higher, at 45 percent. Percentage of children under age five whose births are registered by region. 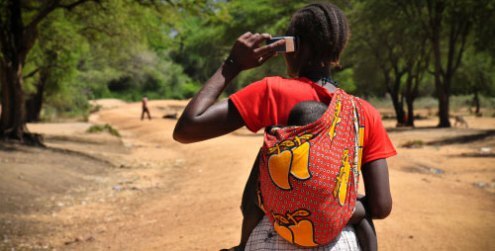 Many UNICEF country offices are exploring the use of mobile communications technologies, including cell phones, to increase birth registration coverage. As a result, access to reliable data in real time is being used for planning and decision-making. Mobile and digital technology can be used to obtain timely, accurate and permanent records. In Uganda, UNICEF and a private sector partner, Uganda Telecom, are piloting a mobile and web-based technology to digitise birth records, making the birth registration process faster, more accessible and more reliable. According to the Cambodia Demographic and Health Survey (CDHS) 2010, just over 62 percent of children under five are registered in Cambodia, which is lower than the 2005 figure of 65 per cent. CDHS 2010 also shows a huge gap in birth registration between urban and rural, and between the rich and the poor. 60 percent of children live in rural area registered their birth comparing to 74 percent of children living in urban. 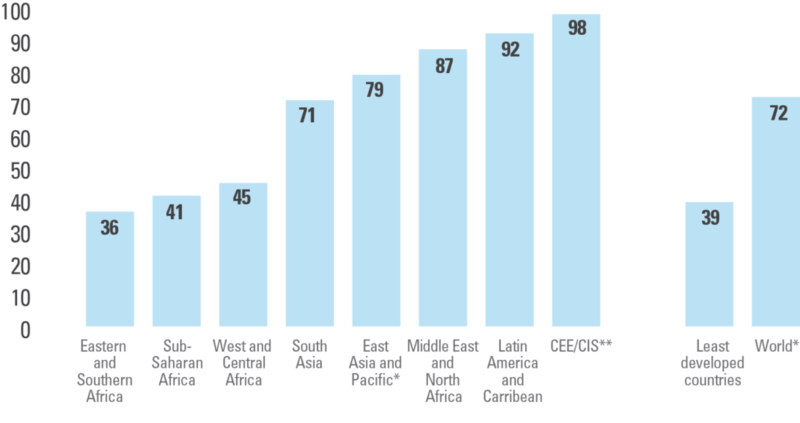 There is gap between the rich and the poor as well with only 48 percent of the poorest children registered as opposed to 78 percent of the richest as shown in the graph. Since 2011 MOI, with UNICEF support, has been implementing a pilot initiative in 32 communes of three districts in Kampong Speu, Prey Veng, and Svay Rieng Provinces to model the most effective ways to address the issues that cause low levels of birth registration. The pilot outcomes will also guide key stakeholders for policy and programme adaptation. The form/design of the birth certificate is not durable especially for rural families, who are at higher risk of damage and loss. Communes and districts often experience a shortage of birth certificate supplies causing inconsistency and delays in providing birth registration services. Parents find the process of birth registration of newborn children – especially late registration – complicated and rigid. The paper-based, manual monitoring and reporting system leads to poor data management, low information quality and irregular or late information flow. One of the recommended action is to implement a monthly routine outreach and real-time reporting of birth registration through short-messaging services (SMS). To help solve this issue, UNICEF Cambodia together with General Department of Identification (GDI) set up a pilot IVR platform using a combination of RapidPro and the cloud communication channels Twilio and Nexmo. This solution would, for the first time, help ensure communes would never be out of stock and babies could be registered as soon as possible – a vital protection method for children. Each month commune clerks report the number of forms and/or books in stock either by responding to the automated monthly calls initiated by RapidPro or by calling the system. The data is then analysed by RapidPro. If the numbers of forms or books in stock are below a certain threshold, RapidPro will automatically notify the district level by SMS and the province level and GDI by email. The district officers in charge of re-supplying forms and books receive SMS notifications on communes that need restocking, helping to ensure communes will be equipped to register all children. RapidPro is being used all over the world in a variety of ways to assist children and families, supported by UNICEF’s Global Innovation Centre (GIC). The GIC acts as a centre of excellence that is powered by a growing global network of UNICEF offices, specialists and allies dedicated to using technology that can have a large-scale impact on the lives of children. Maps4health? What is the connection between healthcare and maps? The 1854 London Cholera Outbreak map developed by Dr. John Snow is considered one of the very first example of Geographic Information System (GIS). Dr.Snow developed a sort of proto-GIS supporting his theory that cholera was a water-borne disease. His analysis showed a connection between number of cholera deaths and wells location. This is just a very first example of the linkage between health and maps. Maps can be used for complex geographic analysis of health indicators but also simply to identify the exact location of health centers or healthcare services. 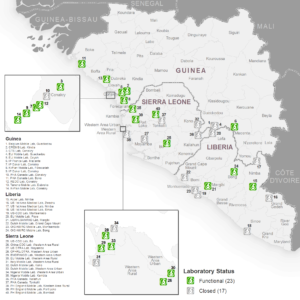 Particularly in emergency situations, such as the 2014 Ebola crisis in West Africa, maps were used to locate health facilities, laboratories, schools, wells and any other significant infrastructure that could provide information to support aid workers facing the emergency. Combining this information with other indicators such as population data, number of disease cases, etc… maps provided a better overview of the disease widespread and its effects. 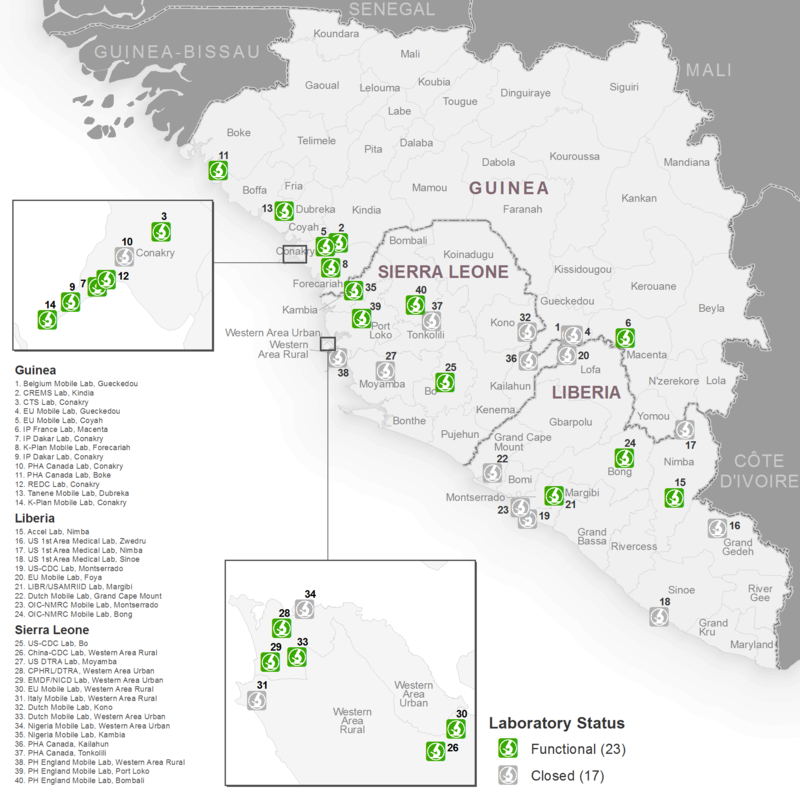 H ere is an example of maps developed by WHO showing, on the left, the location of laboratories in the areas affected by Ebola Virus in 2015 and, on the right, the number of Ebola cases in October 2014. Identifying the exact location of health facilities is not always an easy task, especially if using a top-down approach, asking government bodies, health authorities or organizations. On this regard, healthsites.io is an interesting tool, that uses an alternative, bottom-up approach to identify healthcenters around the world, providing information such as their geographic position, services provided, number of full time/part time beds, staff availability, etc…The application is an opendata initiative, therefore freely available and anybody can contribute by using their Facebook or Twitter account. It’s a project co-founded by Mark Herringer, Tim Sutton and Dražen Odobašić, and supported by many partners such as ICRC, MSF, HIF (International Hospital Federation), the Health Care in Danger project and HOT(Humanitarian OpenStreetMap Team). Healthsite.io can be particularly useful in emergency situation, (i.e. : in case of disease outbreaks or natural disasters) in order to have baseline data or assess damages or even, more importantly, to help people seeking for medical care. Of course, the main challenge is to verify the information and keep it updated but the network of organizations behind it, such as the Humanitarian OpenstreetMap Team (HOT), MSF and ICRC, is already a great start! Those crowds are not only made by patients but also by NGOs’ and organizations’ staff who are running their programs by bringing different types of medicines or collaborating with health staff to collect healthcare information. Each organization brings its own project, maybe a pilot one, with a good amount of requests or activities to be implemented. So, for example, beside already established standard government forms or registers, community Health Workers (CHWs) are asked to fill out additional forms/registers. Although the final objective should be to facilitate their work and improve the provision of health care to the most needed, unfortunately this often creates an extra burden to the already understaffed facilities, it generates confusion, overload and waste of precious time on bureaucracy, time that should be rather spent on patients’ care. Furthermore, health workers may receive incentives for the extra workload, thus changing work priorities resulting in poor/ late reporting of standard and well established data to the Ministry of Health. Many of those pilot projects also involve the use of digital information, using digital data instead of paper forms. 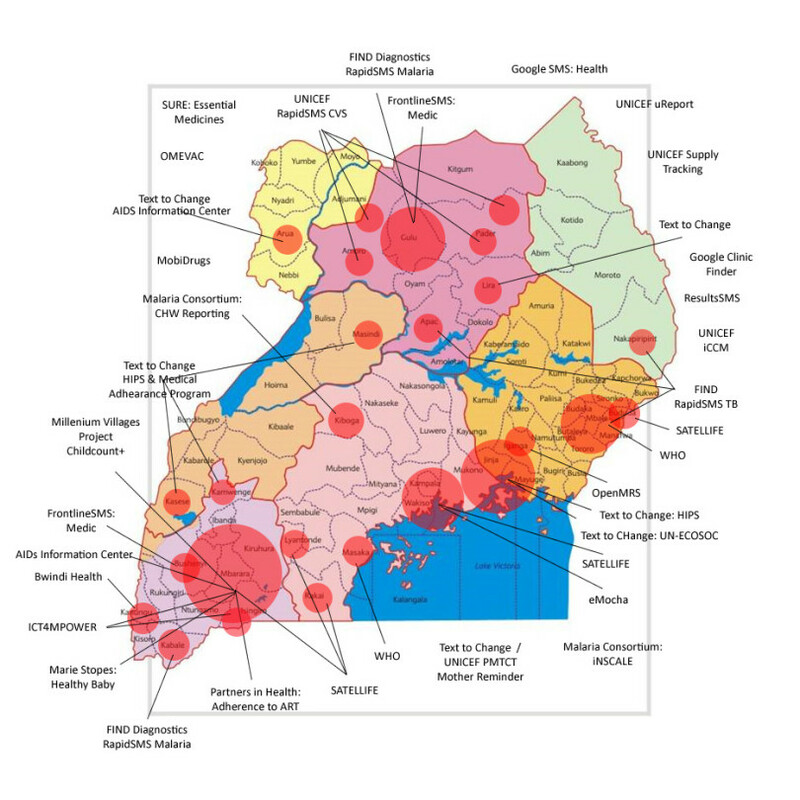 A significant example of the fragmentation of digital health programs is illustrated on the measles map of Uganda developed by Sean Blaschke at UNICEF, as mentioned by Dikki Se ttle in his post on Pathblog. 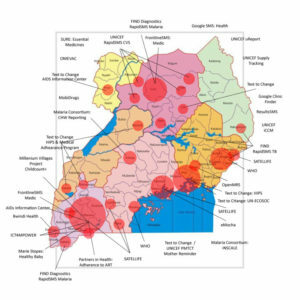 The map itself explains why in 2012 the ministry of Health in Uganda called a halt to all eHealth and mHealth Initiatives in the country until they got approval from the Director General of Health Services. The objective was to limit the fragmentation of programs and make sure that the data collected up to that point would feed into the national digital Health Information System, rather than creating additional parallel systems. The widespread of digital information is already a step forward towards the integration of information as ICT can facilitate the information and data exchange especially if data is collected in appropriate and compatible format. ” You’ve managed to track drug stock-outs in a sub-county in Moroto using solar chargers and 50 Samsung Galaxies. That’s great, can we share data with a similar project I did using BlackBerries in Gulu? Probably not. You’ve rolled your own drug-stock-tracking application. And yet when members of Big Aid met with the Ministry of Health, to account for the overlapping features of their mHealth applications and whether API integration is possible, one actually responded along the lines of “well, it’s backed by a relational database, so in theory, yes.” While true, this misses the intent of the question by a wide margin’. Maybe the halt promoted by the Ministry of Health in Uganda is a way towards increasing interoperability and coordination of projects. For sure, it indicates that government has started to look into taking ownership of these projects and technology to serve the population’s needs. In other countries specific mobile-health groups, such as the mhealth working group in Malawi, are meeting regularly, with the involvement of the Ministry of Health, to face the issue of integration and overlapping of mobile health projects. Both the use of compatible technologies and the involvement of stakeholders at various levels are two key elements to start overcoming the problem of mhealth projects fragmentations. Ong 2.0 dedicates this month to “Women and tech”. So, if you’re active on Twitter, you’ve probably came across the hashtag #mWomen. mWomen is a new tagline referring to mobile tools and programs centred on the needs of women, usually those living in developing countries. – Targeting female entrepreneurs, small business owners, and agricultural workers with relevant market information, up-to-date prices, weather reports, tips and advice for expanding their business or improving productivity. We’d like to introduce a useful Android-based mobile application created for women, that gives advice on a variety of health, social and legal issues. Through this app any woman can ask any question without revealing her name. The app maintains total anonymity for its users, who only need an email address to register. Expert advice is usually provided within 24 to 48 hours by a team of doctors, lawyers and counsellors. They respond in the language indicated by the user’s questions. A startup called maya.com.bd has launched this mobile app for women in Bangladesh. The developers of the app, Achia Khaleda Nila and Shubrami Moutushy Mou, both women, argue that the app can be instrumental in empowering women in the country. 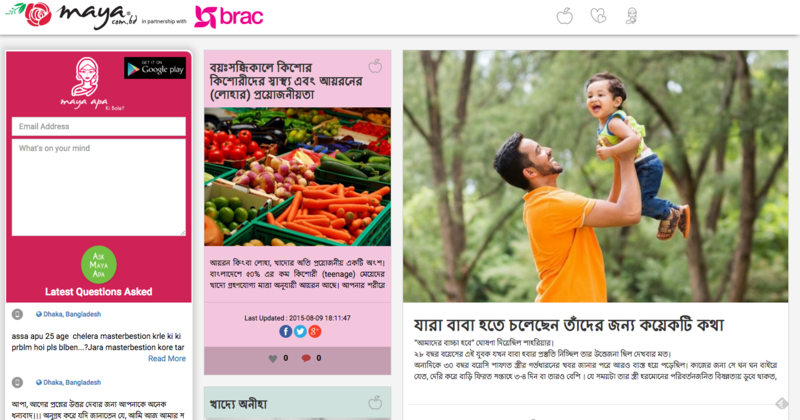 The app was funded by the development organisation BRAC. The status of women’s health in Bangladesh is not satisfactory. Each year 600,000 women die from complications related to pregnancy. 66% of adolescent girls get married before the age of 18 and 64.3% become pregnant before that age. These young girls cannot talk about their health problems to one another because of the social stigma attached to it. As a result, various types of health, social and legal problems go unsolved. These women are the app’s main target. Maya Apa app can be downloaded from Google Play Store free of charge. Samsung Mobile Bangladesh also announced that this app is now available for all Samsung Smartphones sold in Bangladesh as part of their corporate outreach. Maya’s team also won a prize at the Bangladesh Brand Forum’s Inspiring Women Award 2015 in the Best Start Up category. Allow rural women to reach you on their own time by including pull content, or incoming call capabilities. If you allow a woman to call in to access the content, she can call when she feels it is convenient. To ensure the content is free, women should also be able to flash in and be called back with the content, as incoming calls are free. Make it easier for people to pass on the phone to the target audience, who may not be the primary holder of the phone. For SMS, you may consider including the user’s name in the content, so the phone owner knows to pass the phone onto the target end user. Send calls at a standard and convenient time. You should work with participants to find out the exact timing that is ideal for rural women to have phone access as they could be busy with their daily activities at the household or in the farm. Consider providing physical community phones. These physical installations allow for anyone in the community to access a program’s services. If your budget is higher you could also provide phones to all of the end users to ensure they have access. However, this choice has to be carefully evaluated and it’s only viable when the phone is a core part of the initiative. If you know your target end users, group them appropriately by sharing status. Ask your target end users whether they are phone owners or not, and then you can group your subscribers by sharing status. Use a technology solution that fits the context of poor network, low credit, often uncharged batteries and so on. Maternal and newborn mortality rate is very high in many low-income countries. Deaths are often caused by complications that are not properly or timely treated such as the mother begins to bleed after giving birth or the newborn is not breathing. However, it has been proved that an estimated 90% of the existing maternal and newborn deaths could be prevented with access to basic skilled care during pregnancy and childbirth. Many health workers in the periphery of the health system do not have the sufficient level of training and are difficult to reach with traditional classroom training, as they are placed in remote health stations. The Safe Delivery App is an mHealth training tool for birth attendants in low-income countries to reduce the high maternal and newborn mortality rate caused by lack of skilled care at deliveries. Wherever medical staff cannot undergo a full training on delivery care, the Safe Delivery App can assist health workers with animated videos, action cards, drugs information on recommended dosages and side effects and practical procedures for simple operations to handle childbirth complications such as prolonged labour, hypertension and maternal sepsis. The tool addresses all seven signal functions of Basic Emergency Obstetric and Neonatal Care based on global clinical guidelines from WHO. The app has been developed by Maternity Foundation, University of Southern Denmark and University of Copenhagen and it has been tested in a randomized controlled trial in Ethiopia, across 78 health facilities. The results have showed that the ability of health workers to handle postnatal bleeding and to resuscitate a newborn more than doubled after 12 months of using the app. The Safe Delivery App will be rolled out across sub-Saharan Africa in partnership with Ministries of Health and NGOs. Beside The Safe delivery app there are other tools that can assist in delivery care, for example Totohealth allows expectant parents to receive health messages via SMS based on the stage of their pregnancy, including reminders on health clinic visits. And in Nigeria, telecommunications company Airtel teamed up with Grameen Foundation to launch the Mobile Midwife app, providing healthcare and nutritional information for pregnant women. The Safe Delivery App is free for download at Google Play and at App Store. As the current refugees crisis is spreading through Europe and all over the World, we have decided to open a dedicated session in our blog. When this tragedy reached our borders and, above all arrived on our media, many initiatives were born to involve the tech community on these issues. The first one was Mike Butcher’s Techfugees a conference and a hackathon where the London tech community showed their support to refugees. In a few days a Facebook group and Twitter accounts exploded, showing the huge interest of the tech community to be involved in this issue. Many other conferences, events, hackathons have been organized all over Europe, including one event in Italy, hosted by H-Farm. Particularly, Gnucoop created a blog, called Blogfugees, that wants to be a focal point for all the organizations working for refugees and needing or looking for help from technology experts; a the place where we collect everything that can be found online on “Technology for Refugees”. 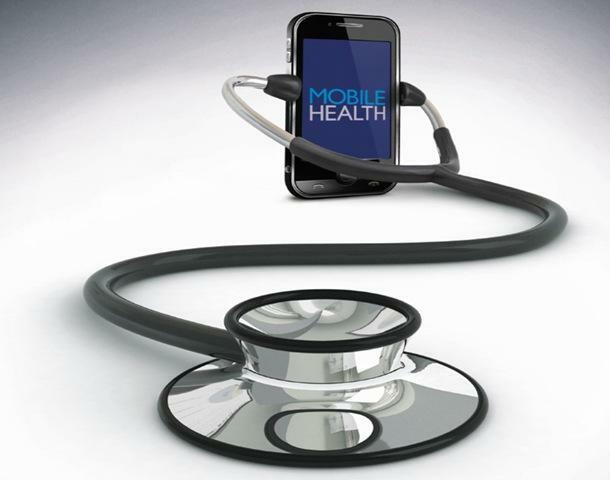 But you are now probably wondering… so what’s the connection with mhealth? As we already know, one of the most important mhealth application is the use of mobile tools to help in the diagnosis of diseases, expecially in remote or difficult contexts. Well, as winter starts to bite, health conditions in the migrant camps across Europe are of concern to health authorities and health providers. While there is concerted effort to improve the general conditions in these camps, progress is slow because of the scale of the task and the difficulty of providing significant numbers of doctors there. Regarding provision of healthcare, there is one free medical app, called MedShr, that is attempting to address these challenges by enabling doctors to upload, share and discuss medical images on a closed professional network. In camps where health conditions are very poor, MedShr is proving to be a valuable tool for doctors in the camps. MedShr was founded in 2013 with a UK DTI Research and Development grant by Dr Asif Qasim, a London cardiologist, with the objective of creating a platform for doctors to connect with each other and discuss clinical cases in a secure place. Many medical apps helping during the refugees crisis, such as MedShr, have become more and more important. By connecting specialists with support, diagnoses and treatment, MedShr has been used by organisations such as Médecins Sans Frontières and The Red Cross to work out how to support doctors in the field and contact informal groups of volunteer doctors. A recent University of Birmingham report, underlines that conditions in the camp do not meet standards recommended by the UN Refugee Agency (UNHCR) and the World Health Organisation (WHO) and that ‘the shortcoming in shelter, food and water safety, personal hygiene, sanitation and security would have detrimental long-term health consequences for the camp’s residents over their lifetime’. Apps such as MedShr are among a number of apps that people and organisations are developing to help with the crisis. From ECGs, scans and X-rays to patient photos and videos, MedShr helps finding and discussing relevant medical cases with colleagues, by specialty and at all grades. MedShr shares secure data, using private network and features a unique system for obtaining patient consent. Doctors have the possibility to follow clinical cases and learn from their peers with informal and accredited case based discussion. MedShr is the simple way to capture, share and discuss clinical images and videos in everyday practice. It is possibile to create a case, obtain consent and start a discussion securely from a mobile device mobile. Send medical cases to colleagues, share them with the wider community,etc…MedShr is safe, secure and enables members to maintain complete control over the privacy of their cases – with all members being 100% verified as doctors, healthcare professionals and medical students. Medical students and doctors of all levels are joining MedShr to advance their learning as they connect with peers from their university, place of work and across the world. Connect and follow specialists to keep up to date on their latest cases, techniques and learnings. Medical students, junior doctors and specialist trainees use MedShr groups as a resource for informal learning, ahead of case-based examinations and as an aid to formal learning. “MedShr is a brilliant idea – smartphones connect doctors, making it possible for aid workers to get an instant medical diagnosis” – Rohan Silver, Evening Standard. http://www.ong2zero.org/en/files/2015/12/Mhealt.jpg 410 615 eloisa http://www.ong2zero.org/wp-content/uploads/2014/08/Logo1.png eloisa2015-12-23 14:33:332017-08-29 17:19:56How mhealth can help Refugees in Europe?